According to a new WMUR Granite State Poll, Democrats have a slight lead in the U.S. House and Senate races, but voters are still mostly undecided in the race for New Hampshire Governor. The poll, conducted by the UNH Survey Center, included 532 randomly selected New Hampshire adults. 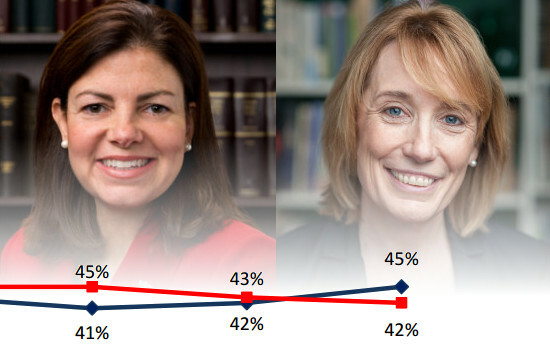 45% of poll respondents said they were likely to vote for Maggie Hassan in the race for U.S. Senate, while 42% said they would vote for Kelly Ayotte. 14% said they would vote for someone else or were undecided. This is the first time Hassan has come out on top of Ayotte in a Granite State Poll. Given the margin of error, the race for U.S. Senate is a dead heat. Although five Republicans filed in the race for the 1st congressional district, the Granite State Poll only asked participants about two of those candidates: incumbent Frank Guinta and challenger Rich Ashooh. Carol Shea-Porter is the only Democratic candidate in the 1st district. In a matchup of Guinta and Shea-Porter, 43% of poll respondents would vote for Shea-Porter and 37% would vote for Guinta. In a matchup of Ashooh and Shea-Porter, 46% of poll respondents would vote for Shea-Porter and 29% would vote for Ashooh. About a fifth of voters were undecided. Seven Republicans filed in the race for the 2nd congressional district. The Granite State Poll asked respondents about two: current state Rep. Jack Flanagan and former state Rep. Jim Lawrence. Incumbent Rep. Ann McLane Kuster is the only Democrat running in the 2nd district. In a matchup of Flanagan and Kuster, 38% would vote for Kuster and 32% would vote for Flanagan. In a matchup of Lawrence and Kuster, 38% would once again vote for Kuster and 32% would vote for Lawrence. About a third of voters were undecided. Five Democrats, five Republicans, and four independents have filed to run for New Hampshire Governor. According to the Granite State Poll, 29% of likely Republican voters said they would vote for Chris Sununu in the Republican primary, giving him a seven point lead over the other candidates. However, 28% of likely Republican voters were still undecided. 19% of likely Democratic voters said they would vote for Colin Van Ostern in the Democratic primary, giving him an eleven point lead over the other candidates. However, 57% of likely Democratic voters were still undecided, leaving the race wide open. Do you know who you will vote for in the 2016 elections? Visit our elections area to learn about all the state and federal candidates in New Hampshire, from experience to issue positions.